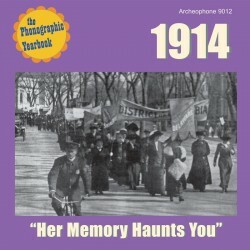 1914: "Her Memory Haunts You" features 25 selections from the year that the hopes and dreams of the progressive coalition that had put their faith in the presidency of Woodrow Wilson saw their agenda put on hold while economic issues--and then the beginning of World War I--took center stage. The soundtrack to the year brings us a good mix of future classics and songs of the moment, odes to country life, and more than a handful of songs longing for home and hearth, both pathetic and humorous. As with Archeophone's other Phonographic Yearbooks, 1914 includes a full-color 24-page booklet. Visit 1914's expanded catalogue page to see the complete track listing, read an extended description, and listen to sound samples.